Stan Getz - Early Stan (1949/1953) - compilation of 9 tracks recorded in 1949 under the leadership of Terry Gibbs and 4 tracks from 1953 under the leadership of Jimmy Raney. Stan is sideman at these sessions. Stan Getz Quartets (1949) - compilation of his late 40s, early 50s work, some of the tracks also appear on the "Roost" compilation. Stan Getz - The Complete Roost Recordings - another compilation of his 50-52 work, a box set of quartets with a rhythm section featuring Al Haig, the Storyville albums, (live session at a club in Boston with Jimmy Raney in 1951), and more (including 3 tracks with the Count Basie orchestra at Birdland in 1954. Stan Getz - The Lighthouse Sessions - at the Lighthouse Cafe at Hermosa Beach, Los Angeles, California. V.A. - West Coast Jazz - recorded in Los Angeles in August 1955 with trumpeter Conte Candoli, pianist Lou Levy, bassist Leroy Vinnegar and drummer Shelly Manne. Stan Getz And The Cool Sounds - collection of recordings from 53-55, includes some tracks from the "West Coast Jazz" sessions, and some similar pieces including trombonist Bob Brookmeyer, trumpeter Tony Fruscella, drummer Max Roach and others. Stan Getz/Dizzy Gillespie/Sonny Stitt - For Musicians Only - Dizzy Gillespie's intricate charts put Getz, bassist Ray Brown, and saxist Sonny Stitt through their paces. John Lewis piano, Stan Levey on drums. Stan Getz - The Steamer - more West Coast jamming, rhythm section is Lou Levy, Leroy Vinnegar, and Stan Levey. released on Verve Records. Stan Getz And The Oscar Peterson Trio - Playing the Great American Songbook in California with Peterson, Herb Ellis and Ray Brown. Stan Getz And J. J. Johnson At The Opera House - concert for Norman Granz's JATP at Chicago's Opera House. Rhythm section is Oscar Peterson, Ray Brown, and Connie Kay. Stan Getz/Cal Tjader Sextet -Getz and Latin-jazz vibraphonist Cal Tjader with a group including Eddie Duran on guitar and Scott LaFaro on bass. On Fantasy Records. Stan Getz At Large - Double live CD from Stan from the Cafe Montmartre, Denmark. Stan Getz - Cool Velvet: Getz with strings and harp arranged by Russell Garcia this was later released as a 2-in-1 CD with the 1966 album "Voices"
Stan Getz/Charlie Byrd - Jazz Samba (Verve V/V6 8432) - the launch of the samba craze in the US, includes Desafinado, remastered in 1997. Stan Getz/Gary McFarland - Big Band Bossa Nova (Verve V/V6 8494) contains 'Manha de Carnival' and 'Chega Suadade'. Stan Getz/Luiz Bonfa - Jazz Samba Encore! (Verve V/V6 8523) - bossa nova in a slower groove, with vocals by Maria Toledo and compositions by Luis Bonfa. Stan Getz/Joao Gilberto - Getz/Gilberto (Verve V/V6 8545) the album that made the bossa nova sound into a craze. Getz, guitarist Joao Gilberto, pianist Antonio Carlos Jobim. Tracks include Girl from Ipanema the debut recording of Astrud Gilberto), Corcovado, and Desafinado. Recorded March 18th and 19th, 1963 in New York, produced by Phil Ramone. Stan Getz With Laurindo Almeida (Verve V/V6 8665) - more Brazilian sounds, recorded with guitarist Almeida two days after Getz/Gilberto, but this is a jazzier record than the bossa hits. Produced by Creed Taylor. Stan Getz - Nobody Else But Me - the "lost album" with Gary Burton. Not being bossa nova Verve Records refused to release it. Gene Cherico on bass and Joe Hunt on drums. Stan Getz And Bill Evans coupling of these two stars, recorded for Verve Records in 1963. Tracks from these sessions appear on various Verve compilations under both Getz' and Evans' names. Stan Getz - Getz Au Go Go - with Astrud Gilberto live at the Cafe Au Go Go in New York's Greenwich Village. Gary Burton on vibes, Gene Cherico on bass, Joe Hunt on drums. Stan Getz - Live in London - recorded at Ronnie Scott's in spring 1964. Stan Getz - Sweet Rain - the departure from bossa nova back to cool jazz, the title track a composition by Michael Gibbs, album includes Ron Carter on bass, Grady Tate on drums and Chick Corea on piano. Stan Getz - Captain Marvel (Verve (E) 2304 225) - jazz-rockish outing with a group led by Chick Corea (electric piano) (who also composed most of the album}, and including Stanley Clarke, Tony Williams, and Airto Moreira. The Bill Evans Trio Featuring Stan Getz - But Beautiful - European concert recording with Evans, begins with a tense onstage dispute over the playlist and Evans' refusing to join in on some numbers!! Stan Getz/Jimmy Rowles - The Peacocks - produced by Getz, who plays here with pianist Rowles, Buster Williams and drummer Elvin Jones. Stan's reurn to the mainstream, the albums "The Dolphin" and "Spring is Here" were sets from the same gig and were later released as the "My Old Flame" CD on Concord Records. Lou Levy (piano), Monty Budwig (bass) and Victor Lewis (drums). Stan Getz - Anniversary! - The newly drug-free Stan live at the Cafe Montmartre, Copenhagen on July 6th 1987. Kenny Barron piano, Rufus Reid on bass and Victor Lewis on drums. Stan Getz - Serenity - another set from that night at the Montmartre. there is a compilation CD "Cafe Montmartre" with tracks from these albums. Stan Getz - Apasionado - light fusion-ish sound by Kenny Barron on electric piano and keyboards, drummer Jeff Porcaro, Oscar Castro Neves on guitar, and percussionist Paulinho da Costa. Bossas & Ballads- The Lost Sessions (2003) - recorded in 1989 but not issued until 2003. Again with Kenny Barron on piano, also George Mraz bass and Victor Lewis drums. Produced by Herb Alpert. Stan Getz - The Last Recording (DVD) w Kenny Barron and the band in Munich in 1990, one year before Stan died. Stan Getz, Palmer, Richard. 1988. Stan Getz: an appreciation of his recorded work, Kirkpatrick, Ron. 1992. Stan Getz: nobody else but me, Gelly, Dave. 2002. 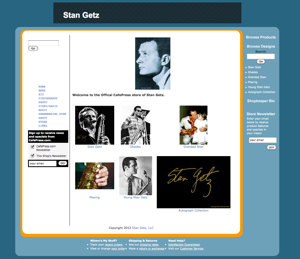 Stan Getz: an annotated bibliography and filmography, Churchill, Nicholas. 2005. Jazz saxophone: an in-depth look at the styles of the tenor masters, Taylor, Dennis, 2004.